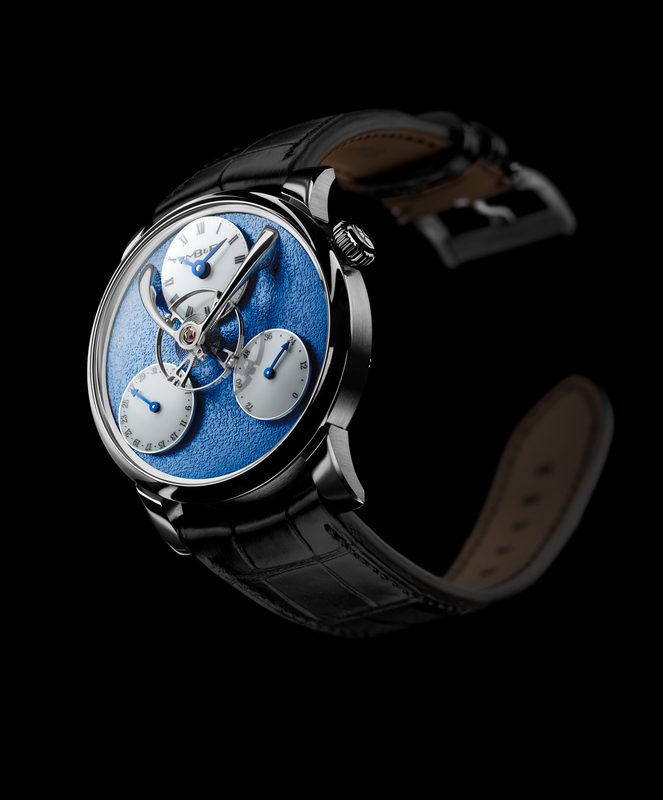 MB & F, which has an important place among the boutique brands of the industry, introduced the latest model of the Legacy Machine Collection. The new model, which can be considered the most “normal” one of the family, draws attention with its movement bearing the Split Escapement feature. The new model, which features the Legacy Machine Collection’s DNA in its aesthetics, comes in four different versions limited to 18 units only for each. 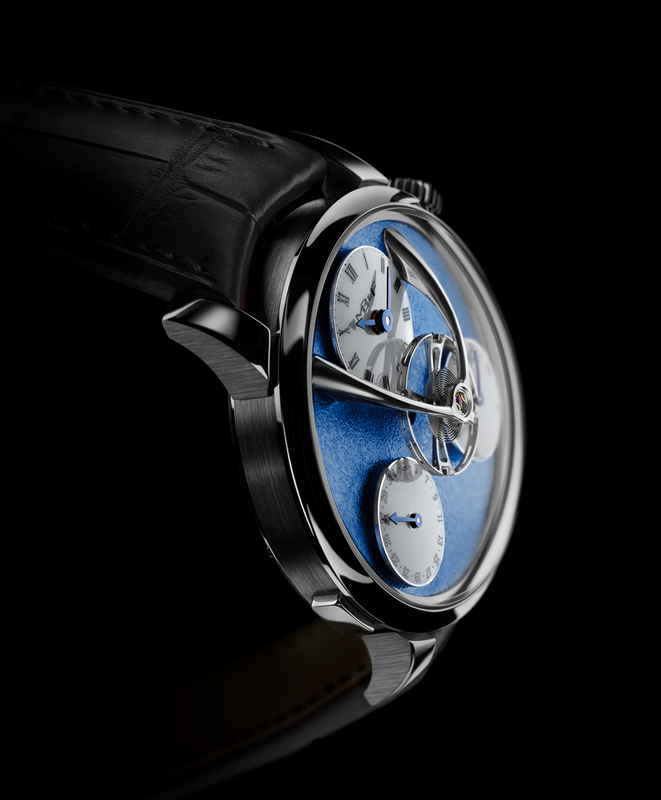 MB&F Legacy Machine Split Escapement comes in an 18K white gold case measuring 44m x 17.5mm. Equipped with double AR coated scratch resistant sapphire crystals on both sides, the case is water resistant to 30 meters. The new collection features four different dial options: red, golden yellow, gray and blue. The dial lay-out is designed in Legacy Machine Collection style with white lacquer sub-dials. The sub-dial at 12 o’clock reads the time. The one at 4 o’clock is for the power reserve indicator and the sub-dial at 7 o’clock shows the date. Irrespectively of the dial tone, the surface of the dials are “frosting” finished which looks like they are made out of stone. Like in the previous models of the collection, the frosting texture is completely handcrafted by using a wire brush. When you look at the dial, the first eye-catching detail is the fairly large designed balance wheel (14mm). The balance wheel, supported by a thin bridge made of polished metal, is not connected to an escapement. 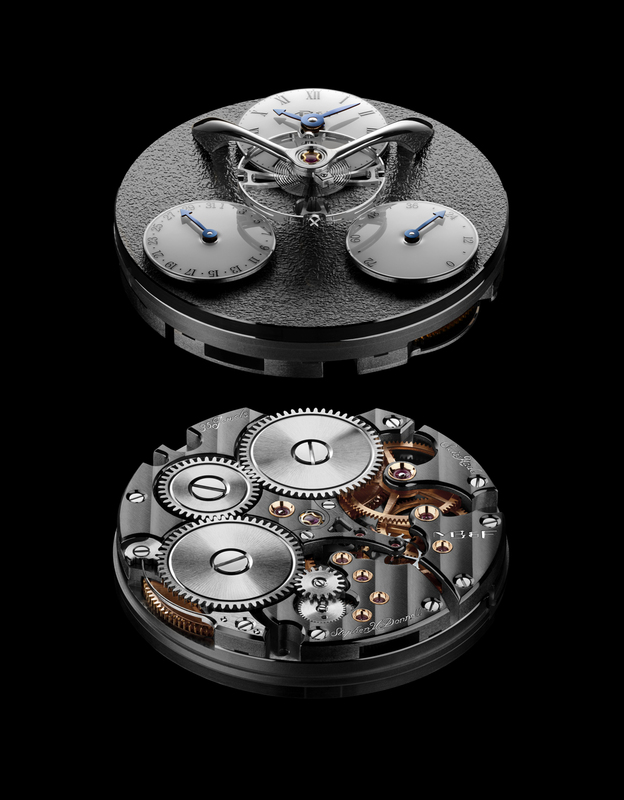 As a result of the movement’s design, the balance stuff goes to the back of the movement, where the escapement is located. The “back side” part is actually quite important as the main action takes place at that side. 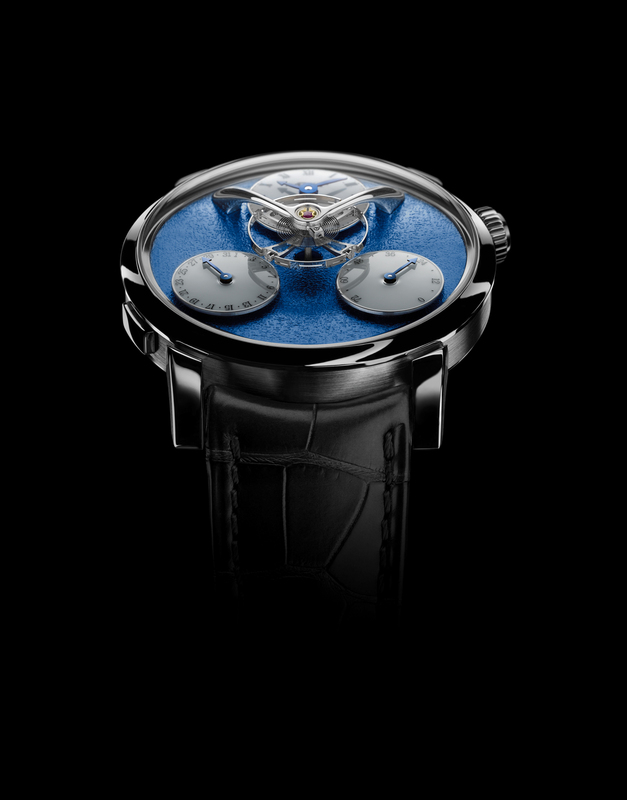 The “engine” (this is what MB & F calls it), which is designed by the master watchmaker Stephen McDonnell, is originally based on the movement which has been used to power the Legacy Machine Perpetual Calendar model. Though each dial option has its own movement plating to suit with the selected color palette, all movements are built and finished identically. The polished bevels on the bridges are impressively detailed, as are the polished countersinks on the jewel chatons. Even the spokes of the wheels are detailed extensively despite their less obvious nature. Attention is similarly paid to less obvious components, including the spokes of the wheels. 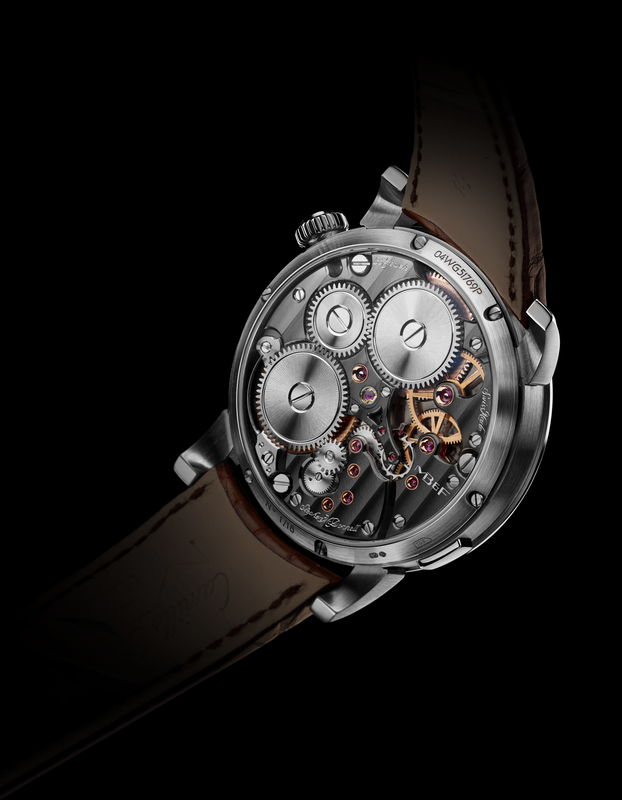 The hand-wound movement beats at 18000vph and offers a 72h power reserve when it’s fully wound, thanks to its double barrel winding system. 35 jewels movement is composed of 314 parts and features a date display and a power reserve indicator besides time keeping function. 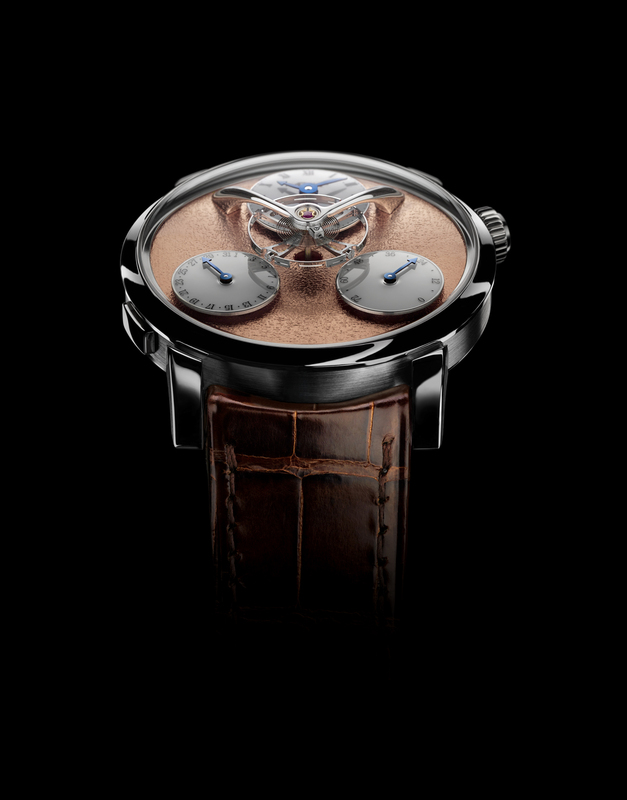 All versions are limited to a span of 18 units per each and available at MB & F boutiques or M.A.D Galleries. MSRP is US $ 79,000 (US list).